Cac & Succ relly’s can set your design apart ..
Long gone are the days when anything succulent was relegated to ‘that corner’ at most nurseries and disregarded collectively as weirdo cactus. Go to any decent Plant Fair and you are spoilt for choice with plants possessing some of the most ornamental characteristics imaginable. And why choose them ? Because they set your design apart like few others can AND offer huge advantages in low water use. Kalanchoe beharensis – Madagascan Felt Plant is very often encountered in its larger leafed form as a kind of living sculpture. Did you know there are smaller oak leafed forms that make rather impressive texture hedges or can be used to anchor otherwise ‘fly away’, leafy combinations that run a risk of looking all the same when seasonal flowers have gone over. 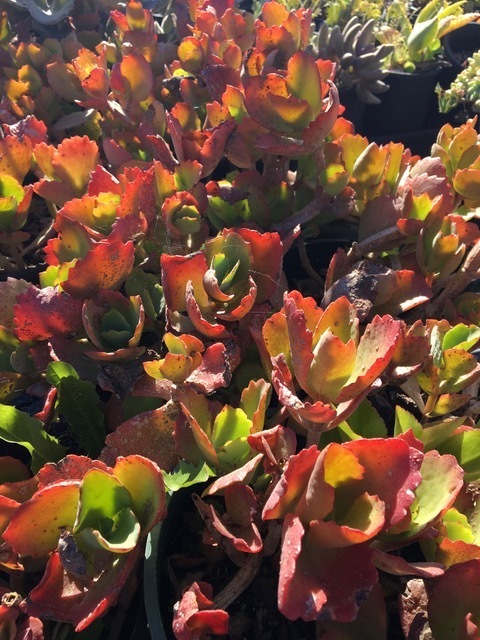 Kalanchoe somaliensis excels for unirrigated garden spaces, beneath an open sky aspect with much valued ground-covering & weed suppression qualities. Also has high ornamental appeal as a ‘textural rug’ that brightens with winter night air. Contrasts with just about anything but especially appealing with an ultra-fine like Lomandra fluviatilis ‘Shara’. Cyanotis foecunda an equally drought resisting, stoloniferous sheet cover and unsurpassed as a turf replacement, where weed suppression is important and low maintenance a part of the design brief. Providing its a ‘no go’ look to surface only, that’s NOT expected to withstand even light foot traffic due to its snappy stems that would crush under foot. I’ve used this one many times with the benefit of its self striking stolons that also grip surface soil to help prevent erosion across slight falls. ‘Planty Fierce ’18 was great and a sunny brom grower for you too.. ! Late last month on Sat 28th April, brought a fresh Autumn day for ‘Planty Fierce’ after a much needed morning shower to both my ‘Sea-Changer’ and Ray Henderson’s ‘Paradox’ and plenty of interest from visitors looking for inspiration and a few new treasures from Peter & Ruth Donnelly’s Coachwood sales tables for their own gardens. 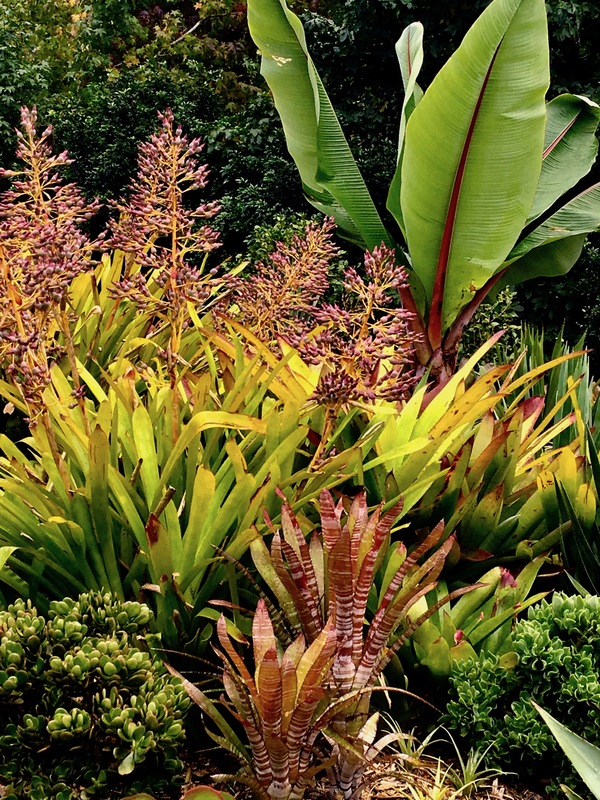 If sun adaptable bromeliads would get you out of a lot of trouble, for that elevated N/W aspect you’re wrestling with for your client’s design…. 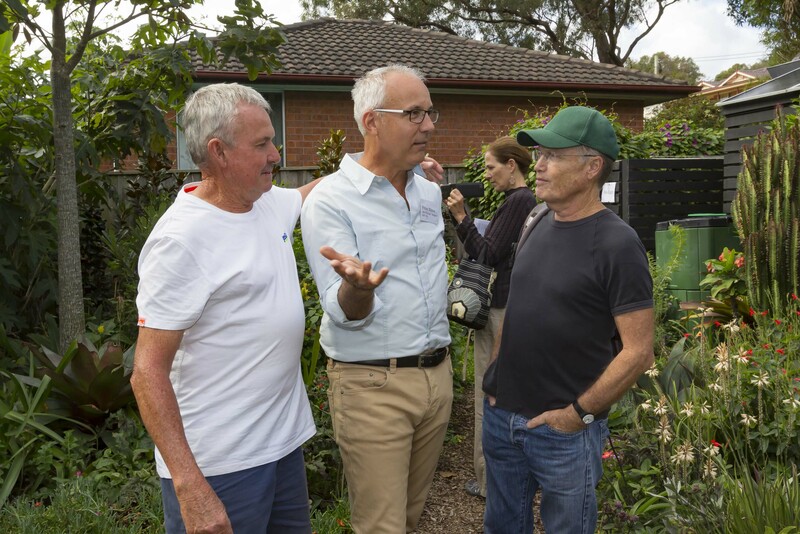 look no further than Ray Henderson Horticulture to see his heroic ‘Paradox’ plantings at Central Coast’s Glenning Valley. Ray is your ‘go to guy’ for a myriad of sun adaptable aechmea, billbergia, hohenbergia and even neoregelia that will LOVE your western aspect, even growing as lithophytes over rock with limited or no irrigation. This is the best time of year to plant too, going into cooler weather to give your plants time to adjust into the increasing heat of next season sans scorch and with dazzling ‘stained glass’ colours. ‘Planty Fierce’ is almost here THIS Sat 29th April … ! 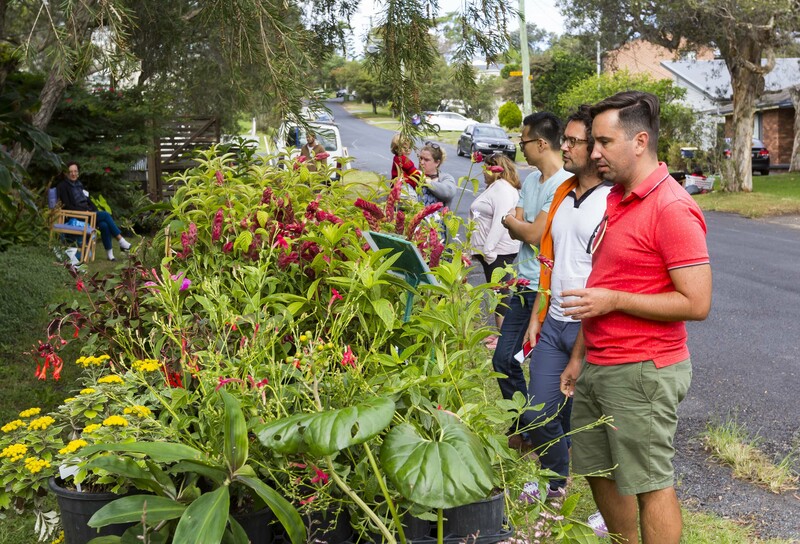 This Saturday, 29th April ‘Planty Fierce’ opens 10am – 4pm $5 entry each garden, across three wildly exciting and horticulturally driven spaces made from plants. See all event details, map & lunch suggestions at Facebook’s event page ‘Planty Fierce’ Expert horticultural and design ideas for your gardens, with exciting designer plants sales at each garden – bring plenty of boxes, you’ll need them! Keen interest from last year’s ‘Planty Fierce’ ..
Peter Nixon’s 2pm designer “walk & talk” at ‘Sea-Changer’ and weather forecast is Good !!! Robin Powell’s feature on ‘Sea-Changer’ for ‘Planty Fierce’ in last Saturday’s SMH Spectrum .. see you there !!! ‘Planty Fierce’ Sat week on 29th April … ! Start at any of these three fabulous Central Coast gardens only 20 mins apart, bursting with designer inspiration made by industry horticulturists. These are their own home gardens, where they have really been able to let it rip in mining the rich vein of warm temperate coastal plant selection. ‘Planty Fierce’ … Sat 29th April, just 2 weeks away ! 3 Central Coast industry gardens within 2o mins of each other, 1 day 10am till 4pm, $5 tiny dollars entry each garden, (children free, no dogs) PLUS fabulous plant sales at every garden. How can you resist !!! ‘Planty Fierce’ Event Map ..
Mia culpa maxima … forgot to send you a map guide for this Saturday 5th March to get around to all four fierce garden offerings !! Just click here on ‘Planty Fierce’ to print off the reverse side that has an easy map to follow, showing all garden addresses and their map locations.